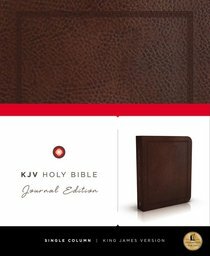 About "KJV Holy Bible Journal Brown Leathersoft (Red Letter Edition)"
These handsomely bound Bibles arrange the text of Scripture in a 7-pt type single column format, with 5cm-wide lightly ruled margins on either side for notes and reflections. Also features thicker cream paper, word of Christ in red, lay-flat binding, ribbon marker. The KJV Single-Column Journaling Bible provides the perfect way for you to keep a journal of your spiritual life right inside the Bible that you read and study each day. With sophisticated covers found on the finest journals, this journaling edition with ruled lines in the extra-wide margins enable users to align their notes with specific verses. This unique Bible makes a great gift and lasting keepsake for anyone who values God's Word.